2018 IID Meeting Update: New Insights Into Pustular Psoriasis - Elias and Williams: The Inside-Out of Skin by dermatologists and skin researchers Peter M. Elias, M.D. and Mary L. Williams, M.D. 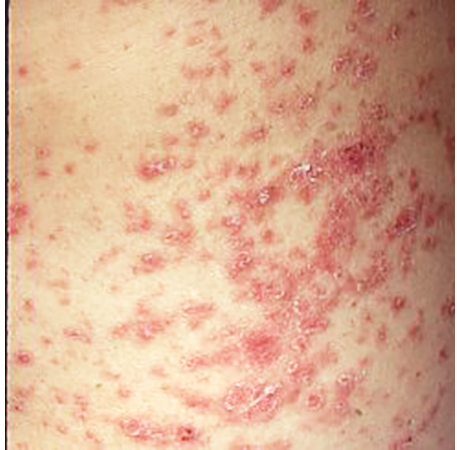 Pustular psoriasis is a type of psoriasis in which pustules, rather than red, scaly patches, are its clinical hallmark. These psoriasis pustules are ‘sterile’, meaning they are not produced by a bacterial or viral infection. The pustules can be scattered over much of the skin surface, but more often are entirely localized to the palms and soles. To develop a better understanding of this uncommon and often severe variant of psoriasis, a consortium of dermatologists from all over Europe and Asia pooled their data on 863 patients. Somewhat surprisingly, they found that many patients also had the more common, plaque-type psoriasis on other parts of their skin. Pustular psoriasis was more frequently seen in females than males and tended to occur later in life than classic plaque type psoriasis. Many of the patients in this large cohort also had diabetes and high blood pressure. The not uncommon association of psoriasis with the metabolic syndrome (obesity, insulin resistance and hypertension) is increasingly leading to the concept that psoriasis is a systemic disease. Most importantly, the investigators identified two genes, IL-36R and AP1S3, that are both strongly associated with pustular psoriasis. They speculate that these genes may contribute to the development of pustular, rather than the usual plaque-type, lesions in psoriatic patients. What does this have to do with the barrier (our personal obsession)? Several years ago, we showed that while the skin barrier is abnormal in all forms of psoriasis, but much worse in the pustular variety. Psoriasis is a disease that comes and goes, usually worsening during winter months. This has long been attributed to the weaker sunlight at this time of year (and ultraviolet light therapy is often used in the treatment of psoriasis). But winter-time flares of psoriasis could also be triggered by the low humidity inside our heated homes. In another presentation at this year’s IID meeting, we showed that treating the skin of patients with a triple-lipid, barrier repair formulation with similarities to EpiCeram prevented or delayed the development of new psoriatic lesions. Although currently psoriasis is treated with drugs that counteract skin inflammation, it is possible that barrier repair therapy will one day find its place in the treatment of psoriasis, much as it already has in atopic dermatitis. You can sign up below to receive our future articles and updates by email. This illustrated booklet offers up-to-date scientific information about skin and the skin barrier in health and disease the skin and how they work to keep us well. Mary L. Williams, M.D., Featured In The UCSF Office of Sustainabilty Newsletter.